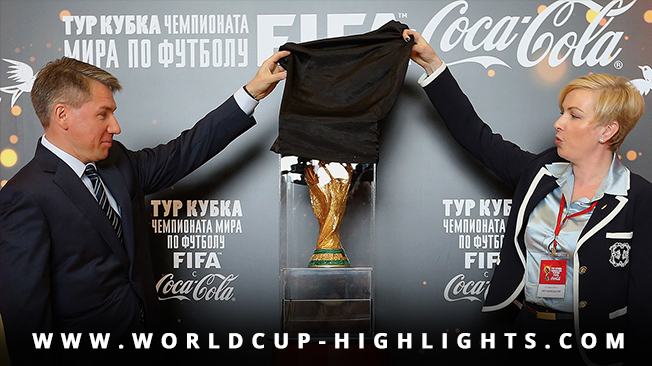 FIFA began touring the 2018 World Cup trophy in Moscow on Saturday (9/9) local time. The event was attended by Russian President Vladimir Putin and FIFA President Gianni Infantino. 2018 World Cup is still ten months away. The Luzhniki Stadium, which will be used as the final and five other matches, has been renovated. In the event of the trophy tour, also appeared to appear Brazilian football star Bebeto and French star David Trezeguet. Putin said all infrastructure preparations will be completed soon. "All goes according to schedule," he said. While Infantino admitted impressed with the revitalization of Luzhniki Stadium. "The stadium is really amazing, very beautiful and it has everything that is supposed to belong to the highest class stadium," he said. Infantino believes that Russia will be a World Cup organizer that will continue to be remembered. "The World Cup is the most famous sport symbol, it is unique," Infantino said. "With this technology, everyone or the audience can be a witness when the umpires make a wrong decision.This will be fair for everyone," he concluded. Meanwhile, Argentina is threatened not to enter into the 2018 World Cup later in Russia. With two games remaining in the CONMEBOL World Cup Qualifiers, Argentina's hopes of qualifying for Russia are getting thinner. Albiceleste failed to win the cons of Venezuela and they must achieve perfect results in the remaining matches. Could the double World Cup champion fail to qualify for the finals for the second time since 1970? Let's weigh and calculate the potential to escape this Jorge Sampaoli troop. Brazil has already secured tickets to the World Cup, while Bolivia and Venezuela have to wait four more years to break through the finals due to early exit. That means living Colombia, Uruguay, Chile, Argentina, Paraguay, Peru and Ecuador are still competing for three other tickets - plus a play-off chance for the fifth-placed country. Argentina, surprisingly, became one of the threatened teams. They only won six out of 15 matches and scored 16 goals. Sampaoli became the third coach to lead in this qualifying round after Gerardo Martino and Edgardo Bauza failed to maximize the role of Lionel Messi and Sergio Aguero. Mathematically, Argentina can still qualify for the finals, but they are required to improve quality on all fronts. Moreover, two opponents of Albiceleste both have the potential and the desire to escape. From 20 World Cups to date, Argentina only failed to qualify once (they were absent in 1938, 1950, and 1954 for refusing invitations to appear). In 1970, Argentina was grouped with Peru and Bolivia, but failed to secure qualifying tickets. They started the run with a poor performance and a 3-1 defeat of Bolivia in La Paz, then the second defeat of the Inca to make the fate of coach Adolfo Pedernera was on the edge. Argentina must secure two victories against Bolivia in the rest of the game, but after a 1-0 win they were held to a 2-2 draw. This poor result ensured the blue-and-white team failed to compete in Mexico. Fans Argentina still have hope to support his team in Russia. The two remaining matches are not the same level of opponent, but with the current inconsistent performance, Biancocelesti threatened to lift the suitcase. Peru waits in early October, then there's Ecuador. Despite the lack of excellence, the two South American nations have a great ambition to qualify for Russia. Few mistakes made by Argentina, Chile can shift them from the fifth rank. If Argentina do not move from fifth rank, they still have a chance to compete in Russia 2018 through a play-off match. In previous campaigns, the fifth rank CONMEBOL had to deal with North American or Asian countries. This time, the Oceania team has the potential to challenge them, namely New Zealand who leads 8-3 over the Solomon Islands.